The springs are some of the most important parts of your garage door system. They are vital to the successful opening and closing of the door, as they support the panels' weight, and are therefore under immense tension at all times. This means that if anything goes wrong with them, they can cause a lot of problems. For this reason, it is highly recommended that you have a qualified professional deal with any spring related issues you experience. Our experts have the knowledge and the necessary tools to handle these components safely, and we can deal with every type of problems. 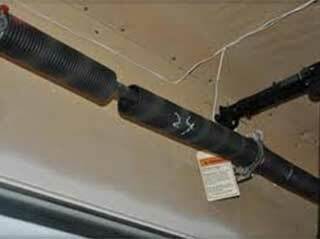 Garage door springs can be unpredictable. While they'll most likely work perfectly most of the time, they do have a limited lifespan. If one such component is not repaired or replaced before it gets too worn or gets to the end of its lifespan, it can break. A broken spring creates a violent release of immense tension, which can cause severely injure or damage any nearby person or property. If you are home when it happens, you won't be able to miss it — the loud BANG will would very much like a gunshot. A door with a broken spring should never be forced open. That means you'll have to leave it alone and contact our professionals to have right away. As soon as you start noticing your garage door springs are wearing down, we recommend that you have them checked by our professional technicians. If their condition is less than optimal, the dangers aren't worth the risk. Regardless of which type of these components you have, our experts can help. We can safely replace both torsion and extension springs with speed and efficiency. Spring maintenance can be a tricky task, especially when it comes to making sure they are balancing the door panels properly. Our technicians have years of experience installing and replacing these dangerous components and we can perform the necessary adjustments safely and easily. Due to the nature of their operation, your springs will need to be adjusted every now and again. They'll also need to be lubricated on a regular basis. This will ensure their smooth and efficient operation. Our technicians at Garage Door Repair Moreno Valley are experts when it comes to broken spring replacement and routine adjustment procedures. Our mission is to make sure every part of your garage door system stays in top condition, or gets replaced before it can do any damage or harm. Call us today.